Just when you thought you were on the bleeding edge of digital marketing because your retargeting capabilities are set up and humming, a report from Forrester Consulting, commissioned by e-commerce data company Criteo, says it’s time to build on that if you don’t want to fall behind. Aw, the life of a marketer in the digital age, right? The report surveyed 152 marketers across industries, and focused in on “performance advertising (also known as performance-based advertising),” which is defined as “advertising whose objective is to drive a specific action and where advertisers only pay when that action, such as an acquisition or sale, is completed.” Probably sounds pretty familiar, and is something you’re doing day in and day out. Some of this may be obvious to you, but in the context of the report’s findings, it’s helpful to take another look at the benefits of performance advertising. Namely, it’s the new normal. According to the report, “Over half of customers expect digital media to work well for them all the time and across all devices, which is a shift Forrester refers to as ‘always-addressable customers,’ and these customers have the power to abandon companies that fail to deliver.” For that reason, nearly 50% of responders say they use retargeting and are now doubling down on personalized advertising. And of course, as mentioned above, if you’re not keeping up with current industry trends – like performance advertising – then you’re falling behind. It seems like just yesterday the industry was abuzz about retargeting, and now it’s commonplace. Forrester’s study found 54% of marketers surveyed are already on to the next thing – delivering advertising content that is personalized for their customers, including product recommendations, personalized offers, and other content at the customer level. And they say it’s paying off. 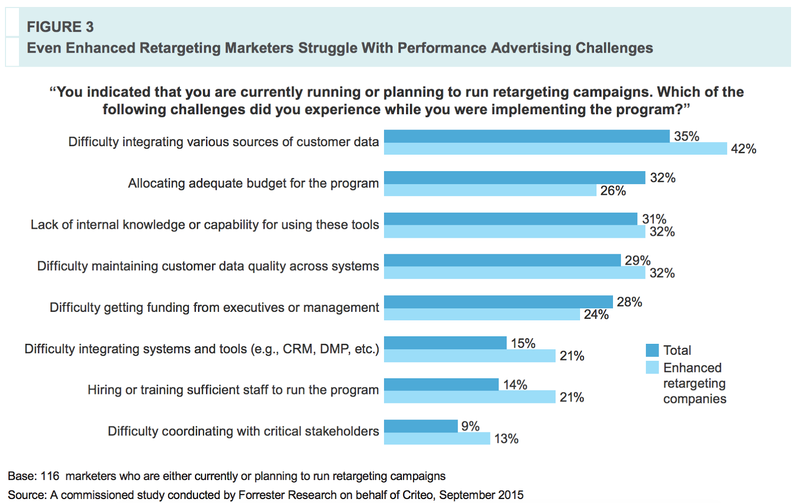 The graph below shows how “enhanced retargeting marketers” (for the report’s purpose defined as “marketers who have invested in at least two capabilities to enhance their retargeting efforts.”) feel about their efforts. 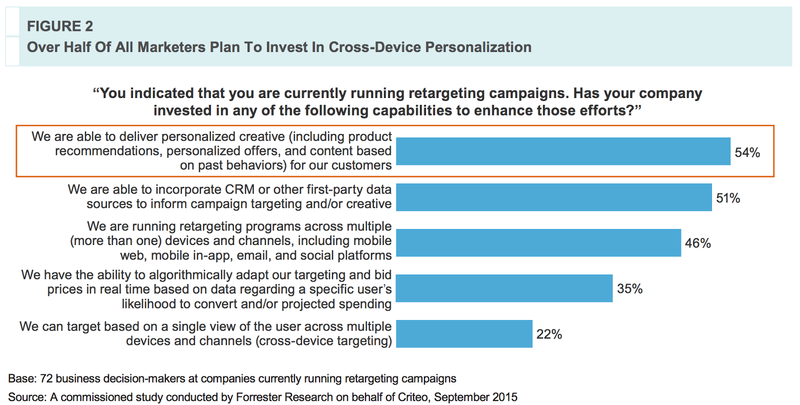 That retargeting is being applied across devices, channels, and customer objectives. 46% of respondents say they’re already retargeting across multiple devices and channels, including mobile web, mobile in-app, email, and social platforms. There’s always a “next” in digital marketing, isn’t there? When going up against other companies with a similar offering which also have a good grasp on digital marketing strategies, personalization can be a powerful, and often crucial, differentiator. The study found that 22% of marketers can target customers based on a single view of the user across devices and channels today, and over half will be investing in cross-channel retargeting capabilities over the next two years (check out the graph below). Marketers say they feel customers are already demanding it, and it’s just a matter of them catching up to give customers what they want. But top-performing marketers aren’t letting anything hold them back and are dedicated to investing in capabilities like delivering campaigns seamlessly across devices, expanding retargeting, and extending enhanced features to a wider swath of marketing efforts. More than half are preparing to build in-house teams and systems to manage the programs going forward. How Are Marketers Measuring Success? Most are still improving their approach, with 70% saying they plan to get better measuring their ad spend effectiveness and 64% saying they will invest in better integration of CRM with attribution/marketing performance. Attribution modeling remains the standard for now. The report showed that 76% of marketers and 84% of enhanced retargeting marketers used at least some form of attribution to measure their campaigns. Of the attribution approaches, predefined rules-based attribution was most common. Probably not a surprising conclusion, but the report emphasized the importance of retargeting, and soon, cross-device personalization advertising. The marketers that are performing well, and will continue to perform at the top, are those that aren’t letting anything stop them from moving quickly to give customers what they want. Don’t stop at retargeting. Figure out how to keep innovating to the next level, and assume the competition is right on your heels. Cross-channel is crucial. Customers expect your messages to follow them across devices. Use data to prove to key team members the potential and efficacy of performance advertising. Twenty-eight percent of respondents stated that making the business case to executives/management was a significant hurdle to adopting their program. Don’t be afraid to ask for help. The study found the most common approach saw marketers managing their programs cooperatively with agency partners. One of the biggest questions marketers are always asking is, “What do customers want?” According to this study, customers are speaking loudly and clearly. They want relevant, personalized messaging that delivers a seamless and cohesive experience across devices. Now it’s up to marketers to make that happen.